Southwest Chicken Quinoa Bean Salad - Hearty and Healthy! 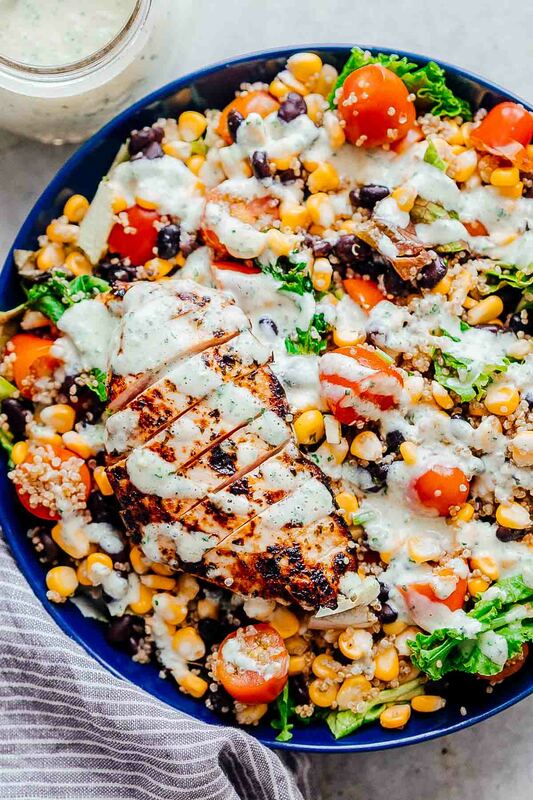 Southwest Chicken Quinoa Bean Salad is a hearty, delicious salad that’s more like a meal. I have two dressing recipes for you to choose from – cilantro lime and a creamy southwest dressing with yogurt and sour cream. This salad recipe is a keeper for warm summer months! I promised you a ton of salads this summer and here’s another one that’s more like a meal but still a salad. Let’s be honest here. I’ve moved away from thinking salads are enough to understanding that I want to eat salads that truly feel like they are enough for dinner. And there’s a difference you know. I’ve eaten too many salads that feel like bird food to know that I don’t want to touch another one. Which is why you see so many hearty salad recipes on this food blog which are really like a meal. They’ve got the lettuce, but they’ve also got ingredients like eggs, beans, chicken, prawns, corn and even pasta that help fill you up. Does that make them healthy? Absolutely! 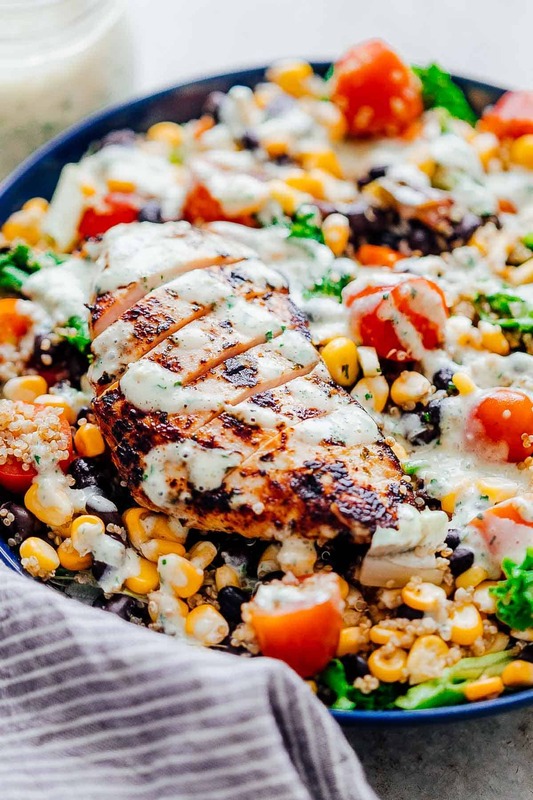 All my salads – Chicken Cobb Salad, Mexican Prawn Taco Salad, Grilled Chicken Mango Salad and this Southwest Chicken Quinoa Bean Salad have ingredients that are good for you and taste amazing when put together with a fabulous dressing. I don’t mean to confuse you but this time I have two dressing recipes for this southwest chicken quinoa bean salad. One is a cilantro lime dressing (more like a vinaigrette) and the other one is a creamy southwest dressing that has cilantro, garlic, olive oil, greek yogurt and sour cream. And both work perfectly with this salad! 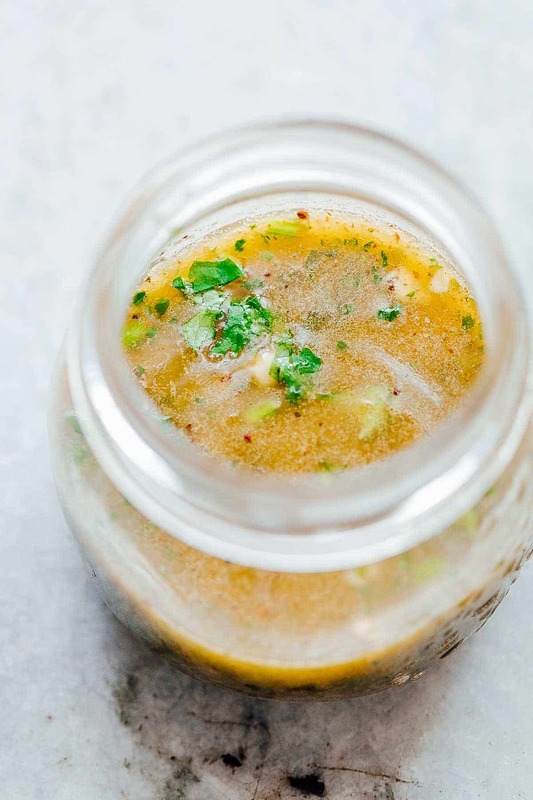 Made with a few simple ingredients – cilantro (coriander), lime juice, olive oil, honey, chipotle powder, garlic, oregano and salt, this dressing also doubles up as a marinade for the chicken that you’ll be grilling for this salad. It has the right amount of acidity and is loaded with flavour. So you see – double the flavour when you use that salad dressing and smother your chicken in it before you grill or pan fry it! Here’s the second dressing. This is a creamy southwest dressing – I really don’t know what else to call it – that’s got my heart when I want all the creaminess in my salad and want a dressing that sticks to every bit of the salad. I may or may not have licked the spoon clean after I made it. This one is also made in a blender and includes sour cream, yogurt, cilantro, garlic, olive oil, chipotle powder, oregano, lime juice and salt. The ingredients are similar to the cilantro lime dressing but we add sour cream and yogurt for extra creaminess factor. Lets just say that I’m drowning this southwest chicken quinoa bean salad. Which doesn’t sound appetizing at all. But no judging here. Hello caramelisation on chicken! I’m glad we are friends! In other news, I’ve been running #featuresundays on Instagram to feature all you wonderful people who try out MFS recipes! If you are one of them, and love taking pictures of your food, tag them @my_foodstory when you post on Instagram and I’ll be featuring you too. Salad Dressing: For either dressings, blend all the respective ingredients in a blender till smooth. Assembling the salad: Transfer all the ingredients for the salad in a bowl and toss with the dressing. If serving later, pour the dressing just before serving to avoid the salad from getting soggy. 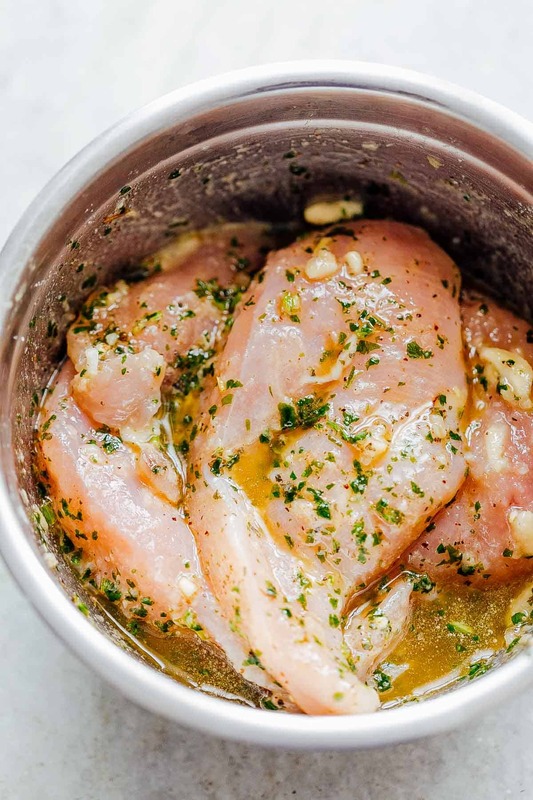 How to cook Chicken Breasts: If you are making the cilantro lime dressing, you can use a portion of the dressing to marinate the chicken for ten minutes and then cook the chicken for 6-7 minutes on each side. If you are using the creamy southwest dressing, marinate the chicken in minced garlic, salt and pepper for ten minutes and continue to cook it. How to cook Quinoa: I’ve mostly seen two varieties of quinoa in supermarkets here – red and white. Either of them work for the recipe. To cook quinoa, it’s really important to wash it thoroughly with water to get rid of the bitter coating that can give quinoa it’s weird taste. Once washed, cook quinoa in water or broth with 1:2 quinoa to liquid ratio till soft and fluffy. Roasted Corn: I prefer roasting my own corn at home for this salad, but you can buy pre-roasted corn or even use frozen corn that is thawed for this recipe. Black Beans: Black beans are my favourite in this recipe, but you can substitute them with kidney beans or any other beans that you have on hand. Make sure the beans are cooked well.